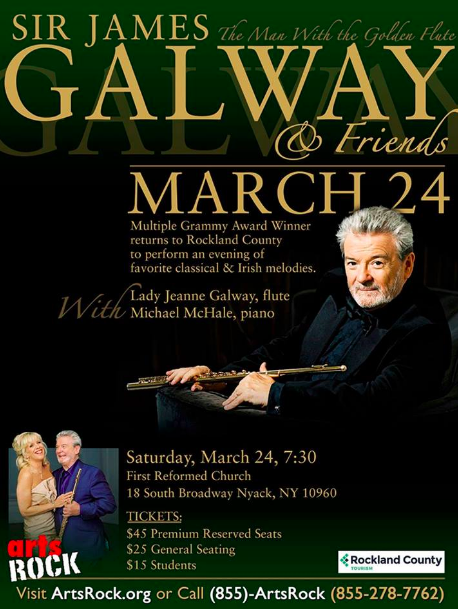 Sir James Galway & Friends and Lady Jeanne Galway with pianist Michael McHale, presenting an evening of classical and Irish melodies Saturday, March 24, 7:30 p.m. at First Reformed Church, Nyack. Produced by ArtsRock. April 7 it will be Songs Of Protest at 7:30 p.m. at BOCES Theatre, Nyack. Contact artsrock.org. Shilelagh Law and Celtic Cross Irish-American bands Sunday, March 4, 2 – 6 p.m. at Empire City Casino, Yonkers. The Pipes and Drums of the Emerald Society of Westchester County will also perform at the prelude to St. Patrick’s Day festivities. Contact empirecitycasino.com. Also, Sunday February 25, Cantonese pop performer Crystal Cheung celebrates the Chinese New Year at ECC. Opening reception of Second Annual Members Exhibition, March 10 at Garner Arts Center, Garnerville. An evening with Katayoun Goudarzi Iranian vocalist Saturday, February 24 at 7:30 p.m. in the Dye Works. Kevin Hayes on piåno and Sergio Krakowski on Brazilian tambourine. Website- garnerartswork.org. Brenda Ferguson, organist, will be the Morning Music Club’s featured artists for their Spring Concert. Event takes placee Tuesday, March 13, 10:30 – 11:30 a.m. at St. Augustine Church, 114 Main Street, New City. Free admission. Contact morningmusicclub@gmail.com. Indigo Girls at Tarrytown Music Hall, Tarrytown, March 15, 8 p.m. Conact tarrytownmusichall.org. Happy Traum in “Coming of Age in the Greenwich Village Folk Revival” takes place Sunday, March 26, 1:30 p.m. at Nanuet Library. Presented by Borderline Folk Music Club, this concert is a multi-media presentation. Contact borderlinefolkmusicclub.org. or Greta at intrend@yahoo.com. Rhythm Of The Dance, Irish Dance and Music at Westchester Broadway Theatre, Elmsford Tuesday March 13 matinee and evening shows. “A Chorus Line,” rated four stars by the Rockland County Times, continues on WBT mainstage. Contact broadwaytheatre.com or 914-592-2222. Jacob Burns Film Center presenting a mix of 41 documentaries and narratives for the Westchester 17th annual Jewish Film Festival March 13-29 in Pleasantville. Opening night featuring “Itzhak,” a portrait of violinist Itzhak Perlman. Visit burnsfilmcenter.org.